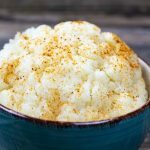 Spicy Keto Cauliflower is a simple and easy side dish that’s tender and delicious. Remove leaves from the bottom of the Cauliflower and discard. Place Cauliflower into a large stockpot with water covering the Cauliflower. Stir in the salt and Crawfish, Crab, & Shrimp Boil. Once the Cauliflower comes to a boil lower the fire and continue letting it boil for 15 minutes or until the Cauliflower is fork tender. Drain and place the Cauliflower into a colander, splash with cold water to allow it stop cooking. Place Cauliflower in a bowl and sprinkle with Old Bay Seasoning. Serve with a fork and enjoy! You could use more than a 1/2 cup of salt if you like your food salty. Also, you could use butter and any topping you prefer besides Old Bay seasoning.